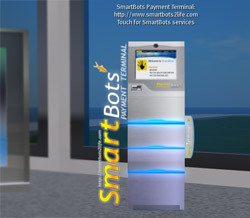 New SmartBots payment terminal is available for public use! This terminal is much easier to use than previous one. The most important feature is support of SmartBots Franchise we are testing now: the commission now varies from 5% (as before) and up to 40% for certified partners. You can take terminal by visiting our office and clicking on the “Get Terminal” tab on the right side of the new terminal. P.S. The information about SmartBots Franchise will be published in a while. IM Glaznah Gassner if you want to participate in testing the franchise.